Tuesday, October 3, 2017 - Email sent to HDC Membership - Call For Abstracts - Fall Workshop! Tuesday, September 26, 2017 - Email sent to HDC Membership - Call For Abstracts - Fall Workshop! Friday, September 15, 2017 - Email sent to HDC Membership - Call For Abstracts - Fall Workshop! Friday, September 1, 2017 - Email sent to HDC Membership -Still seeking Abstracts - Fall Workshop! Tuesday, August 22, 2017 - Email sent to HDC Membership -2nd Call For Abstracts - Fall Workshop! Tuesday, August 15, 2017 - Email sent to HDC Membership - Call For Abstracts - Fall Workshop! Tuesday, June 20, 2017 - Email sent to HDC Membership - Save The Date! Monday, June 19, 2017 - Email sent to the HDC Membership - Welcome our NEW Board! Tuesday, June 6, 2017 - Email sent to the HDC Membership - Please Vote! Thursday, June 1, 2017 - Email sent to the HDC Membership - Please Nominate! Friday, May 26, 2017 - Email sent to the HDC Membership - Nominations Open! Friday, May 5, 2017 - Email - sent to the HDC Membership - Thank You Spring Meeting! Email - sent to the HDC SETAC Spring Meeting Attendees - Spring Meeting Survey! 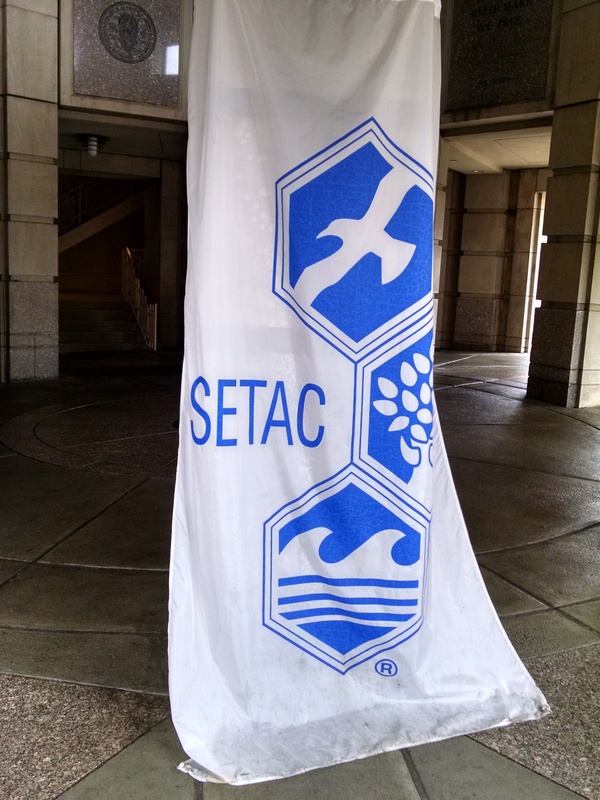 This SETAC Banner has been a part of the Hudson-Delaware Chapter of SETAC for many years. It gets handed down year after year as the Board Members change positions. The banner is normally displayed at each and every meeting. This year the banner was removed from in front of the Walsh Library at Seton Hall University on Wednesday evening, April 26, 2017. The banner is old and a little bit dirty and tattered at the edges. But it signifies the resilience of our Chapter. If anyone has any information on the whereabouts of the banner please let us know. The Spring meeting at Seton Hall University was well attended by 57 individuals. The Wednesday evening dinner was attended by 21 persons.